DCUSU presidential candidates Adam Healy and Christine Farrell were the last candidates to speak at this year’s hustings. The student body let the Accounting & Finance (A&F) society scandal happen, according to presidential candidate Adam Healy. Students’ Union (SU) presidential candidates were questioned at this year’s hustings as to how they would respond to a situation like the A&F society scandal. A&F society was suspended from social activities for semester one due to a hazing incident in October of last year. 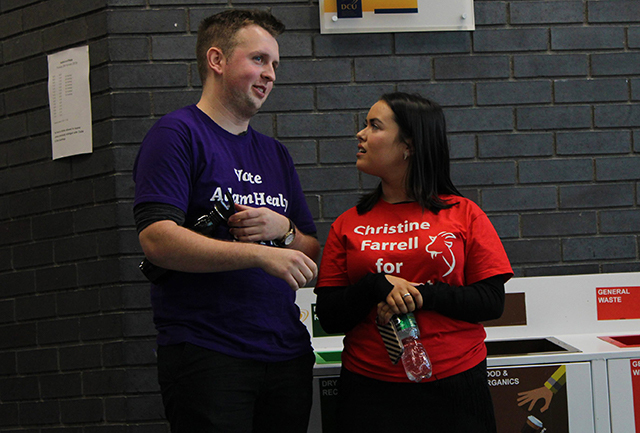 Christine Farrell – who is also running to be DCU’s SU President for 2019/2020 – described the scandal as upsetting, as well as a learning experience. Farrell was the Events Manager for the A&F society when the incident occurred. “It really brought to light the kind of terrible culture that existed within this university,” she said. Healy instead proposed to solve similar situations by having a more productive SU who “nip in the bud” issues as soon as they hear about them. Current DCUSU Vice President (VP) for Engagement & Development Karl McGovern was present for some of the A&F society’s hazing event. Both presidential candidates were also questioned as to how realistic their manifestoes are. Farrell said that she had already worked out the feasibility for some of her proposals, such as free gym classes in the U.
Healy similarly responded and said there was “nothing unrealistic” in his manifesto. Questions were submitted to candidates by DCU students through tweets and written notes, which were given to DCUSU President Vito Moloney Burke – who would then read them out. Candidates could only be asked three questions and had a maximum of one minute to answer. In addition, questions could not be specific to individual candidates in cases where there was more than one person running for the position. This caused a temporary standstill when the chair of the LGBTA society had to reword a question originally directed at VP for Academic Affairs Callaghan Commons, who is running for re-election. Chair of LGBTA, Dean O’Reilly, told The College View that his original question was: “Having been removed from academic life for over a year, how do you still intend on advocating for students?” The question was reworded to fit both candidates and they were eventually asked how they would stay in touch with student life while in the roll. Meanwhile, three candidates are running for VP for Welfare & Equality – more than any other full-time position. It includes the current VP, Aisling Fagan, as well as newcomers Cindee Luna Chin and Cian Conroy. Several candidates did not attend the hustings. Olivia Forde – who’s running for VP for Education & Placement – was the only full-time candidate not to attend, as she was on placement.